Alfred Cellier is a virtual unknown since his works crawled under the shadows of Gilbert and Sullivan. That said, however, Cellier engaged with Arthur Sullivan during his position as a Chapel Royal chorister, and he even conducted several of the mighty duo’s works. Despite its lackluster opening, a Dorothy rework made this the longest running work (931 performances) in 19th century’s light opera, even eclipsing that of The Mikado and Ruddigore. 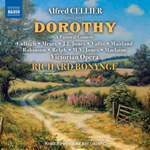 Once again, Richard Bonynge scores high marks by capturing Dorothy in a World Premiere Recording featuring a troupe of well-apportioned singers. Dorothy is nonsensical delight. It serves up a musical concoction of social class interplays alongside mistaken identities, closely sizing up to a “less-refined” Martha. Less intense and grandiose when compared to von Flotow’s 1847 opera, the passages (mostly strophic) are light and amiably benevolent, even when incidents hang underneath a threatening cloud. Majella Cullagh’s persuasive vocal position has retained a keen edge over the years after singing (in 1995) the eponymous role of William Vincent Wallace’s Maritana. With flits of coloratura, the tone gets occasionally raspy, but she well compliments Lucy Vallis’ Lydia Hawthorne. Matt Mears’ Geoffrey Wilder and John leuan Jones’ Harry Sherwood add distinguished suppleness to the nonstop variety of quartets, a quintet and a sextet. Dorothy’s outlined plot is bookended by the impending marriage of Phyllis Tuppitt (Stephanie Maitland) and Sebastian Maclaine as Tom Strutt. The velveteen softness of Mlle. Maitland pairs exceedingly well with the reserved yet polished projection by M. Maclaine. Polite restraint typifies Richard Bonynge’s reflection: it doesn’t overreach, nor does it hold back tentatively. The most vibrant reading goes to Michael Vincent Jones’ Lurcher as the Sheriff’s officer. This tenor has fabulous inflections. He “digs” into the role and gives Dorothy an unexpected dose of effervescent expression. This is the catalyst Dorothy needs to make the work spark with dulcet outlays. Removing all the dialogue (in this recording) truly shows how lovely the music by Alfred Cellier comes across to the listener: it doesn’t take a whole lot mental concentration, and the melodious compilation is gratifyingly superb. The “ballet” and “Dance of the Peasants” sheens with innocent brightness. Richard Bonynge is the perfect answer to addressing this relatively unknown work, and it comes across as a gracious understatement. Dorothy has a congenial appeal. It will certainly captivate those whose affections trend toward the D’Oyly Carte golden era.